Yay! Busy season is over and I can start having fun again! 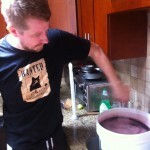 For Christmas I got Joe a wine making kit and some Malbec wine juice. 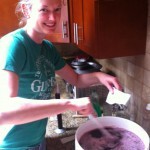 Due to busy season, we have been unable to make the wine until now. The kit is very good. 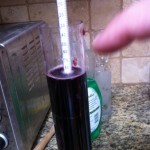 It is from Wine Makers Depot, and has everything required to produce wine, except the grape juice. 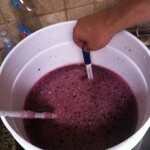 The wine making three has stages: adding yeast to grape juice and allowing it to ferment (takes about 2 weeks), adding clearing agents to the wine and allowing it to settle (takes about two weeks), and bottling the wine and allowing it to age (takes 2 to 3 months). This week we worked on the first stage. 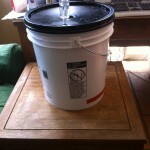 The most important part of wine making is sterilization. 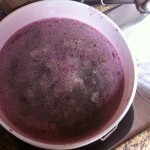 Just like with canning and beer making, if you use dirty equipment, your product will get moldy and be ruined. Most of what we did this weekend was sterilize everything. 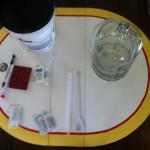 There was a tiny bit of measuring the specific gravity (measuring the ratio of your specific liquid to that of water), and a small amount of mixing yeast into grape juice, but all other time was spent sterilizing. While sterilizing is not super fun, all the measuring and recording of information made it feel like high school chemistry class, which was enjoyable. Some photos from the day.. 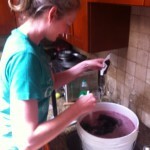 This entry was posted in Uncategorized and tagged Wine Making by Tracy Tripp. Bookmark the permalink.